When viewed from the side, an adult spine has a natural S-shaped curve. The neck (cervical) and low back (lumbar) regions have a slight concave curve, and the thoracic and sacral regions have a gentle convex curve (Fig. 1). The curves work like a coiled spring to absorb shock, maintain balance, and allow range of motion throughout the spinal column. Figure 1. The spine has three natural curves that form an S-shape; strong muscles keep our spine in alignment. Figure 2. The five regions of the spinal column. The two main muscle groups that affect the spine are extensors and flexors. The extensor muscles enable us to stand up and lift objects. The extensors are attached to the back of the spine. The flexor muscles are in the front and include the abdominal muscles. These muscles enable us to flex, or bend forward, and are important in lifting and controlling the arch in the lower back. The back muscles stabilize your spine. Something as common as poor muscle tone or a large belly can pull your entire body out of alignment. Misalignment puts incredible strain on the spine (see Exercise for a Healthy Back). Cervical (neck) - the main function of the cervical spine is to support the weight of the head (about 10 pounds). The seven cervical vertebrae are numbered C1 to C7. The neck has the greatest range of motion because of two specialized vertebrae that connect to the skull. The first vertebra (C1) is the ring-shaped atlas that connects directly to the skull. This joint allows for the nodding or “yes” motion of the head. The second vertebra (C2) is the peg-shaped axis, which has a projection called the odontoid, that the atlas pivots around. This joint allows for the side-to-side or “no” motion of the head. Thoracic (mid back) - the main function of the thoracic spine is to hold the rib cage and protect the heart and lungs. The twelve thoracic vertebrae are numbered T1 to T12. The range of motion in the thoracic spine is limited. Lumbar (low back) - the main function of the lumbar spine is to bear the weight of the body. The five lumbar vertebrae are numbered L1 to L5. These vertebrae are much larger in size to absorb the stress of lifting and carrying heavy objects. Sacrum - the main function of the sacrum is to connect the spine to the hip bones (iliac). There are five sacral vertebrae, which are fused together. Together with the iliac bones, they form a ring called the pelvic girdle. Coccyx region - the four fused bones of the coccyx or tailbone provide attachment for ligaments and muscles of the pelvic floor. Figure 3. A vertebra has three parts: body (purple), vertebral arch (green), and processes for muscle attachment (tan). 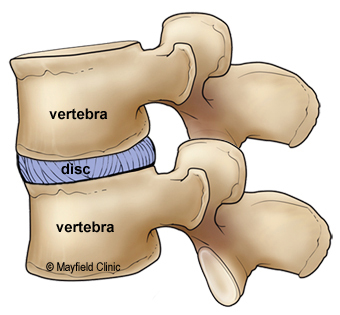 Each vertebra in your spine is separated and cushioned by an intervertebral disc, which keeps the bones from rubbing together. Discs are designed like a radial car tire. The outer ring, called the annulus, has crisscrossing fibrous bands, much like a tire tread. These bands attach between the bodies of each vertebra. Inside the disc is a gel-filled center called the nucleus, much like a tire tube (Fig. 4). Figure 4. Discs are made of a gel-filled center called the nucleus and a tough fibrous outer ring called the annulus. 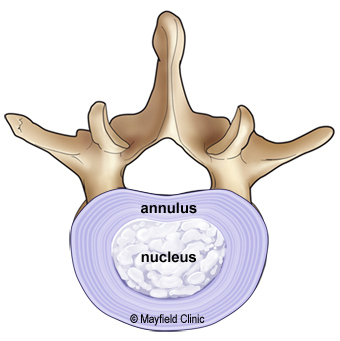 The annulus pulls the vertebrae bones together against the resistance of the gel-filled nucleus. Discs function like coiled springs. The crisscrossing fibers of the annulus pull the vertebral bones together against the elastic resistance of the gel-filled nucleus. The nucleus acts like a ball bearing when you move, allowing the vertebral bodies to roll over the incompressible gel. The gel-filled nucleus contains mostly fluid. This fluid is absorbed during the night as you lie down and is pushed out during the day as you move upright. With age, our discs increasingly lose the ability to reabsorb fluid and become brittle and flatter; this is why we get shorter as we grow older. Also diseases, such as osteoarthritis and osteoporosis, cause bone spurs (osteophytes) to grow. Injury and strain can cause discs to bulge or herniate, a condition in which the nucleus is pushed out through the annulus to compress the nerve roots causing back pain. 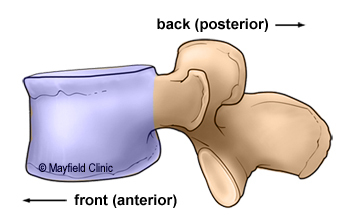 On the back of each vertebra are bony projections that form the vertebral arch. The arch is made of two supporting pedicles and two laminae (Fig. 5). 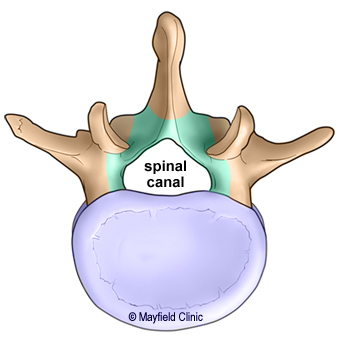 The hollow spinal canal contains the spinal cord, fat, ligaments, and blood vessels. Under each pedicle, a pair of spinal nerves exits the spinal cord and pass through the intervertebral foramen to branch out to your body. Figure 5. The vertebral arch (green) forms the spinal canal (blue) through which the spinal cord runs. Seven bony processes arise from the vertebral arch to form the facet joints and processes for muscle attachment. Surgeons often remove the lamina of the vertebral arch (laminectomy) to access the spinal cord and nerves to treat stenosis, tumors, or herniated discs. Seven processes arise from the vertebral arch: the spinous process, two transverse processes, two superior facets, and two inferior facets. The facet joints of the spine allow back motion. 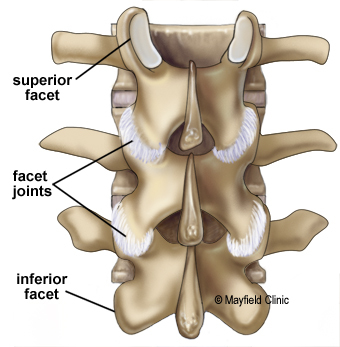 Each vertebra has four facet joints, one pair that connects to the vertebra above (superior facets) and one pair that connects to the vertebra below (inferior facets) (Fig. 6). Figure 6. 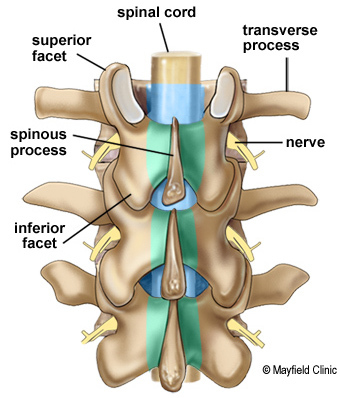 The superior and inferior facets connect each vertebra together. There are four facet joints associated with each vertebra. The ligaments are strong fibrous bands that hold the vertebrae together, stabilize the spine, and protect the discs. 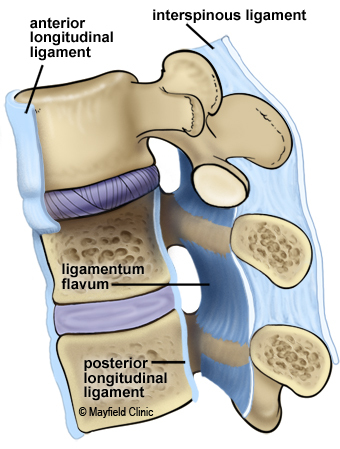 The three major ligaments of the spine are the ligamentum flavum, anterior longitudinal ligament (ALL), and posterior longitudinal ligament (PLL) (Fig. 7). The ALL and PLL are continuous bands that run from the top to the bottom of the spinal column along the vertebral bodies. They prevent excessive movement of the vertebral bones. The ligamentum flavum attaches between the lamina of each vertebra. Figure 7. The ligamentum flavum, anterior longitudinal ligament (ALL), and posterior longitudinal ligament (PLL) allow the flexion and extension of the spine while keeping the bones aligned. 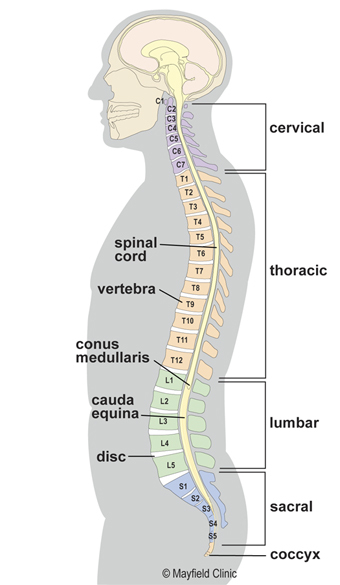 The spinal cord is about 18 inches long and is the thickness of your thumb. 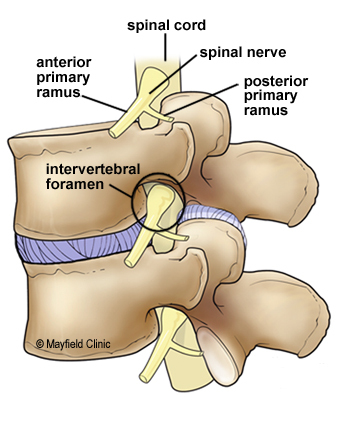 It runs from the brainstem to the 1st lumbar vertebra protected within the spinal canal. At the end of the spinal cord, the cord fibers separate into the cauda equina and continue down through the spinal canal to your tailbone before branching off to your legs and feet. The spinal cord serves as an information super-highway, relaying messages between the brain and the body. The brain sends motor messages to the limbs and body through the spinal cord allowing for movement. The limbs and body send sensory messages to the brain through the spinal cord about what we feel and touch. Sometimes the spinal cord can react without sending information to the brain. These special pathways, called spinal reflexes, are designed to immediately protect our body from harm. Any damage to the spinal cord can result in a loss of sensory and motor function below the level of injury. For example, an injury to the thoracic or lumbar area may cause motor and sensory loss of the legs and trunk (called paraplegia). An injury to the cervical (neck) area may cause sensory and motor loss of the arms and legs (called tetraplegia, formerly known as quadriplegia). Thirty-one pairs of spinal nerves branch off the spinal cord. The spinal nerves act as telephone lines, carrying messages back and forth between your body and spinal cord to control sensation and movement. Each spinal nerve has two roots (Fig. 8). The ventral (front) root carries motor impulses from the brain and the dorsal (back) root carries sensory impulses to the brain. The ventral and dorsal roots fuse together to form a spinal nerve, which travels down the spinal canal, alongside the cord, until it reaches its exit hole - the intervertebral foramen (Fig. 9). Once the nerve passes through the intervertebral foramen, it branches; each branch has both motor and sensory fibers. The smaller branch (called the posterior primary ramus) turns posteriorly to supply the skin and muscles of the back of the body. The larger branch (called the anterior primary ramus) turns anteriorly to supply the skin and muscles of the front of the body and forms most of the major nerves. Figure 8. The ventral (motor) and dorsal (sensory) roots join to form the spinal nerve. The spinal cord is covered by three layers of meninges: pia, arachnoid and dura mater. Figure 9. 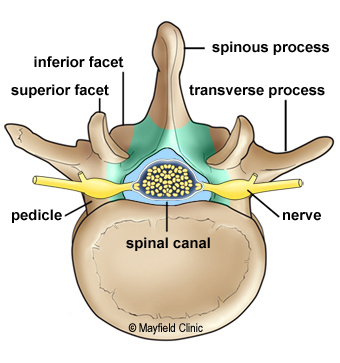 The spinal nerves exit the spinal canal through the intervertebral foramen below each pedicle. The spinal nerves innervate specific areas and form a striped pattern across the body called dermatomes (Fig. 10). Doctors use this pattern to diagnose the location of a spinal problem based on the area of pain or muscle weakness. For example leg pain (sciatica) usually indicates a problem near the L4-S3 nerves. Figure 10. 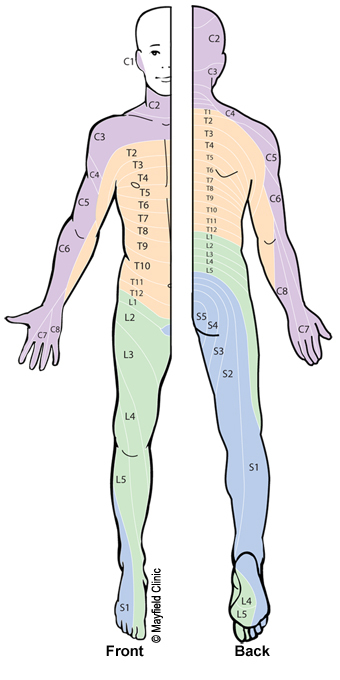 A dermatome pattern shows which spinal nerves are responsible for sensory and motor control of specific areas of the body. The spinal cord is covered with the same three membranes as the brain, called meninges. The inner membrane is the pia mater, which is intimately attached to the cord. The next membrane is the arachnoid mater. The outer membrane is the tough dura mater (Fig. 8). Between these membranes are spaces used in diagnostic and treatment procedures. 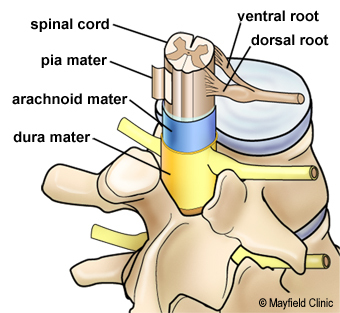 The space between the pia and arachnoid mater is the wide subarachnoid space, which surrounds the spinal cord and contains cerebrospinal fluid (CSF). This space is most often accessed when performing a lumbar puncture to sample and test CSF or during a myelogram to inject contrast dye. The space between the dura mater and the bone is the epidural space. This space is most often accessed to deliver anesthetic numbing agents, commonly called an epidural, and to inject steroid medication (see Epidural Steroid Injections). dorsal: the back or posterior side of the body. kyphosis: an abnormal forward curvature of the thoracic spine, also called hunchback. lordosis: an abnormal curvature of the lumbar spine, also called swayback. quadraplegia: paralysis of both legs and arms indicating an injury to the cervical spine. ventral: the front or anterior side of the body. In recent decades medical scientists have made a quantum leap in their understanding of the human brain and spinal cord. Their discoveries have been fueled by advances in imaging technology and neurobiology. Whether they are studying new surgical techniques, participating in clinical trials, or quantifying outcomes, Mayfield clinician researchers are working every day to discover what works best for our patients. Meanwhile, the Mayfield Education & Research Foundation is funding numerous basic science research projects that advance our understanding about how nerve cells work, grow, die, and repair themselves. Learn more about our spine research at MayfieldFoundation.org.